Disputed penalty: should ETs have the power to impose financial penalties on employers? Well, it had to happen eventually. After many years as the Tweedledum and Tweedledee of the employment policy (under)world – virtually indistinguishable in our views on any number of policy initiatives and legal reforms – Michael Reed, of the Free Representation Unit, and I have had a policy disagreement. And not just a slight difference of opinion, but a full-blown parting of the ways. To quote Michael – something I will be doing a lot less of from now on, obviously – we are “complete opposites” in our view. What? Complete opposites, after all those years of “I agree with Michael” and “I agree with Richard” in meetings with BIS and Ministry of Justice officials? Has one of us lost our marbles? Or taken the Beecroft shilling? All was hunky dory with Michael and me, until last week. But then Acas went and tweeted a news article of theirs about the coming into force, on 6 April, of the new power for employment tribunals to order any employer found to have made a breach of the rules with ‘aggravating features’ – whatever that means – to pay a financial penalty of up to £5,000 (section 16 of the Enterprise & Regulatory Reform Act 2013). And, somewhat unthinkingly, I retweeted it. I’m like that, you see. Impulsive. Almost immediately, my universe began to crumble. “Leaving aside the implementation, do you think financial penalties are a good idea”, demanded a tweet from Michael. Through a veil of tears, I tweeted my pathetic reply: “Yes, though I doubt ETs will ever have the information they need to use the power effectively. I can see it being used very little”. Because, whilst I would have much preferred to see the power more narrowly framed and targeted at, say, repeat offenders and those who have failed to pay a previous award, I do think it a good thing that life might become a little harder (or, at least, a little more expensive) for rogue employers. And, let’s face it, since 2010 rogue employers have done rather well out of all the Coalition’s other reforms of employment law and the ET system. And then he – Michael – said it: “Interesting. We’re complete opposites. I think it’s wrong in principle. And I think it’ll be used reasonably often”. Yep, you don’t get much more completely opposite than that. But enough from me. Let’s hear what Michael has to say. First of all, Tweedledum and Tweedledee? I protest! We are the Butch and Sundance of employment law. Or, at the very least, the Laurel and Hardy. But, through a veil of tears, I turn to the substance of our tiff. Should employment tribunals impose financial penalties on employers, separately to awarding compensation to employees? I start from the position that there’s a name for imposing a financial punishment on people because they’ve acted unlawfully. That’s called a fine. And a fine is properly the province of the criminal justice system. Basically, I don’t think that the State should be extracting money from people in this way without the full paraphernalia of the criminal law — including proper legal aid and proving things beyond reasonable doubt. I realise that, in all sorts of areas, we’ve slid into this sort of civil penalty charge, but I disapprove of all that too. The State, whatever its protests, is a 1000-tonne gorilla. It has immense resources and a monopoly on the use of force as a means of coercion. It has to be self-denying and self-limiting — willing to shackle itself to the rule of law. Or we’ll all end up in unpleasantness. Now, of course, introducing employer penalties does not inevitably lead to a totalitarian dystopia. It’s not even on the top 10 things this government has done which might lead to a totalitarian dystopia. In fact, I think it’s very unlikely to have any real negative impact in the wider sense at all. But the nature of this sort of principle is that it’s important enough that you follow it, even when pragmatically the danger seems non-existent. Even if all of this is wrong, I just think the employment tribunal is the wrong place to be dealing with this sort of fine. A criminal sanction should be applied consistently. Which is why the police and CPS have guidelines about when to take cases to court. Shackling the sanction to unconnected civil litigation means that who gets fined will depend on who gets sued (and who settles). It’s built-in inconsistency. Furthermore, shoehorning a criminal sanction into a civil trial isn’t likely to do either of them any favours. Tribunals have challenges enough dealing with all the issues of party vs party litigation, without bolting on a bit of party vs State for them to address as well. Does no one think of the poor judges? Finally (and this might not be a matter of principle at all), I simply can’t stomach a government that imposes a draconian cap on the compensation that claimants can receive, while attempting to trouser a wedge of cash for itself. The average UK salary is £27,000 (and therefore so is the unfair dismissal cap for the average employee). The maximum penalty is £5,000. The government position is that the cap is needed so people don’t have false perceptions of their likely award. This cannot be reconciled with trying to grab up to 18% of the value of the maximum award for the State. The government’s position on this is contemptible. Sufficiently so that my emotions run high and I couldn’t bring myself to support the financial penalty, even if I could put aside my virtuous principles. Yes but no but yes but … darn it, you’ve convinced me. The section 16 penalties are wrong in principle, and employment tribunals the wrong arena. Can we be friends again? However, I still think the power to impose a penalty will be rarely used, not least because the often low-value claims brought against the kind of exploitative employer at which the power is supposedly aimed, are precisely those claims that have been barred from the tribunal system by the outrageous fees introduced last July. Vulnerable workers subjected to ‘wage theft’ of a few hundred pounds are simply not going to gamble £390 on trying to extract the unpaid wages from a rogue employer. Even where such claims do make it as far as the tribunal, I suspect the average employment judge will be no more minded to impose a penalty than they have been to date to impose a costs order. And, whilst the number of costs orders – and especially orders against claimants – has crept up in recent years, it is still very small. Time will tell. As would the quarterly and annual tribunal statistics, were the good people at HMCTS to take the necessary steps to record use of the power. Unfortunately, it seems they have no plans to do so. Darn it, I was hoping you’d turn me around. Then I could urge tribunals to award large penalties against my opponents with a merry heart (although one of the many minor issues with the scheme will be what, if anything, claimants and their lawyers should say about all this). But at least we’re friends again. I’m much less dogmatic on the issue of how much the new power will be used. It’s really about our gut feelings on how judges will react. And, as anyone will tell you, judges are an unpredictable lot. But, from a judicial perspective, I see the financial penalties as looking more like an uplift for breach of the Acas Code than a costs order. I think judges regularly get a sense of whether they think an employer is a proper wrong’un who has acted maliciously or just a bit of a ninny who made a mess of things. And the principled argument against the whole idea we’ve discussed above don’t bear on sitting judges. They may think the law shouldn’t be there but, since it is, they’ll have to consider it. My guess is that, if they peg someone as a wrong’un and can point to something to describe as an aggravating feature, they’ll be willing to impose a financial penalty. In part, I think this is because it won’t require a lot of additional reasoning or fact finding for the tribunal. One of the reasons that costs are rarely awarded is that they often require everyone to embark on a new set of evidence and submissions right at the end of the case, when everyone just wants to go home (or already has). In the case of financial penalties, things are much easier. All the evidence will be in as part of the liability trial. If, at the end of submissions, a judge thinks a penalty might be appropriate they can flag it with the parties and hear what they have to say. Which probably won’t be much, beyond the respondent arguing that, even if they lose, they haven’t gone as far as aggravated breach. Then the tribunal can cover it in a paragraph or two in their judgment. No muss, no fuss. Of course, you’re right that the reduced number of claims will hold down the number of these penalties (which, come to think of it, is yet another reason why the tribunal is the wrong venue for this sort of thing). But I think, proportionally, we’ll see a reasonable number of these awards. As you say, time will tell (particularly if we get the stats). Shall we schedule a follow-up post for about a year’s time? One of us can crow and the other can explain why they weren’t really as wrong as it looks. Please feel free to endanger the conscious recoupling of Michael and me by taking sides – leave a comment. Unless you’ve just come back from a trip to Mars, you’ve probably seen the quarterly tribunal statistics issued by the Ministry of Justice yesterday, showing a dramatic, 79 per cent fall in the number of employment tribunal claims. (But if you need to catch up, this outstanding blog post by Gem Reucroft tells you all you need to know). In fact, it’s not quite as bad as that, but it’s still very, very bad. The overall number of claims in the three-month period October to December 2013 is down 79 per cent, compared to the same period a year ago. But the overall number of claims includes all the multiple claimants in the relatively small number of multiple claim cases, which are much less affected by the fees regime, not least because the fees paid per multiple claim case are capped at six times the fee for a single claim, regardless of the number of claimants in the case, which can be as many as several thousand. And most multiple claims are brought by a trade union, with the biggest unions now paying such fees for their members. What really matters here is the number of single claims by individual workers. And, compared to a year ago, that is down by 67 per cent. Which is plenty bad enough. Which, as the following chart shows, is utter hogwash. The chart shows the number of single claims by individual workers, so the issue of the ‘big multiple claim cases involving airlines’ is irrelevant. And I challenge Mr Vara and his officials to identify any significant ‘longer term downward trend’ going on here. The simple fact of the matter is that ET claims have fallen off a cliff since the introduction of fees. 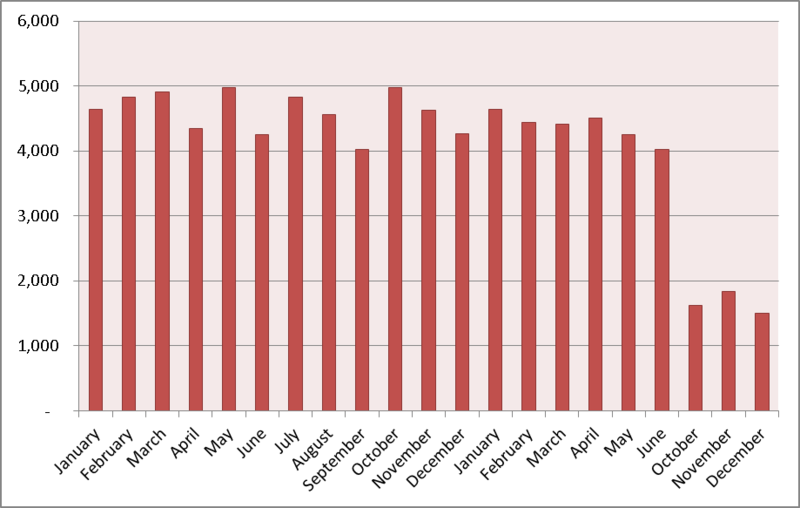 But if anyone in the Ministry of Justice can produce a chart or graph showing a longer-term downward trend behind the figures for October, November and December 2013, we’d be very happy to reproduce it here on Hard Labour. So, exactly how much does it cost to make an employment tribunal claim? You might be wondering – no, I’m sure you’re wondering – how much it costs to make an employment tribunal claim these days. It’s a good question. And who better to answer it than Jenny Willott, the Liberal Democrat MP for Cardiff Central and current BIS employment relations minister? Just a few weeks ago, in the House of Commons, the Minister rather testily insisted to MPs that “it does not cost women [who have been subject to pregnancy discrimination] more than £1,000 to go to a tribunal. It costs only £250 to start a claim, and most cases are finalised well before a hearing”. Well, thank goodness for that! We wouldn’t want excessive cost obstructing workers’ access to justice. However, somewhat confusingly, last week the Minister wrote that it costs “on average £1,800 to present a claim at tribunal” for, say, pregnancy discrimination. It does? That comes to a total of £1,754, which BIS then rounds up to £1,800. So, the Minister’s figure of £1,800 does not include anything for the hefty upfront tribunal fees introduced in July 2013. Which means it costs, on average, £2,050 to issue and pursue a tribunal claim for pregnancy discrimination. Which, according to both Maternity Action and the equalities minister, Maria Miller, is a serious and growing problem. And, where the case goes to a hearing, for which a fee of £950 is payable, that average cost rises to £3,000. So now we know. Thank you, Jenny. The new fangled TUPE provisions contain the express ability for an employer at Reg 4(5B) to change a term incorporated from a collective agreement where (a) the variation takes effect more than one year after the transfer and (b) after the variation rights are no less favourable overall. The problem is that complying with these requirements causes significant problems with an often overlooked section of TULRA 1992. TUPE continues in 5(C) that “Paras (5) and (5B) do not affect any rule of law as to whether a contract of employment is effectively varied“. Which got me thinking as to other rules of law. One of the ones it appears BIS did not think about was Section 145B of TULRA 1992. To save a quick rummage through the statute books, section 145B gives individuals the right not to have their employer make an offer to have any term of employment no longer determined by a collective agreement. So, for example, individuals transfer to a new employer which wants to have nothing to do with collective agreements or trade unions. The new employer grumbles (they usually do) but abides by the immediate terms of the collective agreement to remain on the right side of TUPE. It then avails itself of the ability to change under TUPE 4(5B). It makes sure the offer is not less favourable and in certain circumstances is actually more favourable as they are offering better benefits (e.g. PHI). It would appear, however, to fall straight into the prohibition in Section 145B TULRA. After a bit of double reading (and a diversion as to whether “worker’s agreeing” is grammatically correct), I would suggest (a) deals with the worker agreeing to vary, e.g. at a future point in time, but not actually varying; and (b) with when the variation has actually occurred. If an employer complies with TUPE it can vary terms incorporated from a collective agreement, but if this means the individual will not be covered by that collective agreement then s.145B applies and prohibits the change. But if the individual has actually varied their terms the change is effective. If, however, the individual has not yet varied, they can presumably cherry pick the best terms and refuse to implement the variation. Which is a bit odd or appears to contradict what Reg 4(5B) of TUPE is trying to achieve. The only ways in which the employer avoids paying the £3,600 temerity award are, as I see it, presumably either to negotiate collectively with the trade union it does not recognise over the collective agreement it did not sign. I can’t see a union agreeing to the change to the collective agreement. This leaves the employer in the position of making the offer, paying the award and only then implementing the change if the employees do actually vary the contract. Alternatively the wording of 145B(1)(a) appears to sanction picking off individual employees two by two (readers can insert their own Noah’s ark joke here) if the variations are different. I’m unsure as to what irks me most about this. That TUPE doesn’t work with s.145B, that I’d forgotten about s.145B altogether or that the employer will need to take a temerity award gamble on each employee’s contract it wishes to vary. Or something else. It might be the grammar.